Buying watermelon is always a kind of gamble – even with all the suggested methods for choosing a good one, once you get home and cut it – it’s always a surprise. This time I ended up with a tasty watermelon, that unfortunately was very pale in color, far from the bright, appetizing one I was hoping for. 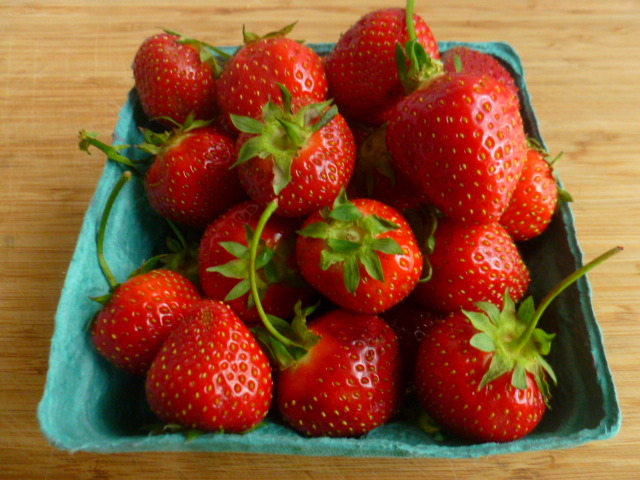 Luckily, I also bought some beautiful fresh and sweet strawberries from the farm stand, so I’ve decided to combine the two in the form of a chilled soup. The first version I’ve made, a sweet-salty and a bit spicy soup, was served as a first course for a light lunch. The second one, a simpler and sweeter version, was served as a light dessert, for a heavier dinner. Since I made more than needed of the last, I put the remaining portion into good use by preparing tasty and refreshing popsicles from it. All the versions were a great success, and I have no doubt I will be making them again, as the watermelon and strawberry season has just begun. These easy no-cooking dishes are just perfect for hot days, when you don’t feel like turning the oven on. Try any of these versions and enjoy. * This type of soup is at its best when served fresh. 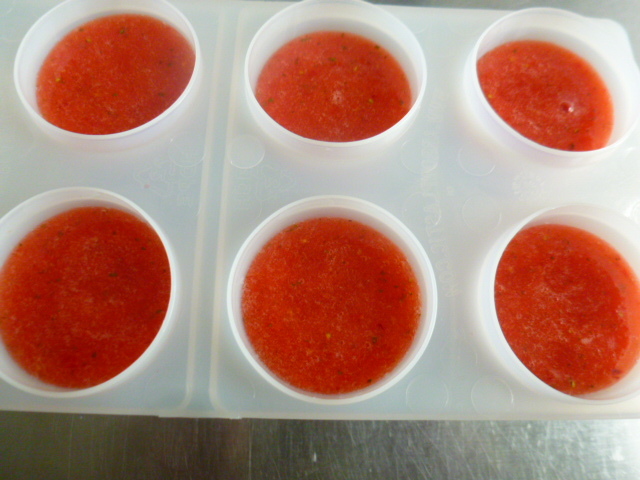 So, keep the prepared watermelon and strawberries chilled in the fridge, and blend the soup just before serving. 1. Place all the ingredients in a large bowl. Blend with a hand blander to a smooth soup. Taste and adjust seasoning if needed. 2. Divide into soup bowls. Add the Feta cheese, olive oil and mint leaves and serve immediately. 2. Divide into soup bowls, garnish with mint leaves and serve immediately. 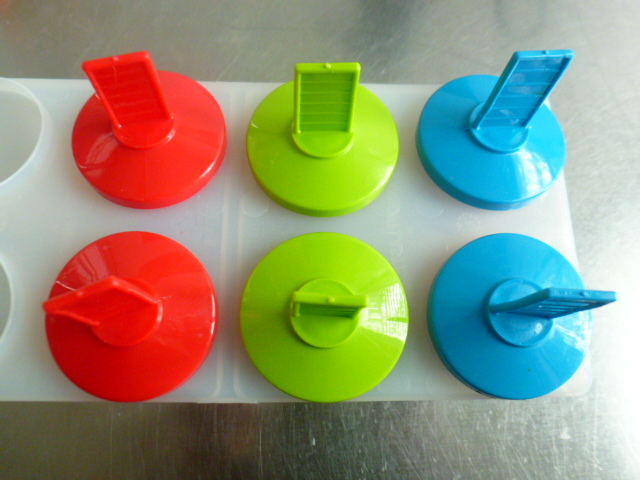 Popsicles: Fill popsicle molds with the soup mixture. Freeze for 2-3 hours before serving. 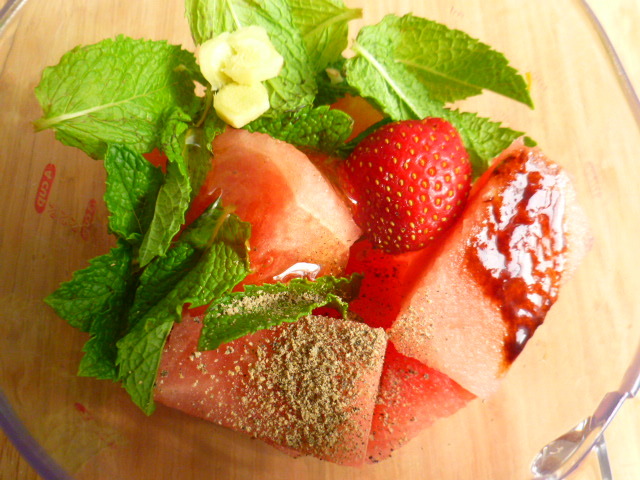 Hi Chef Ronit-we loveeeeeeeeeeee watermelon the small round seedless ones! Yummy. 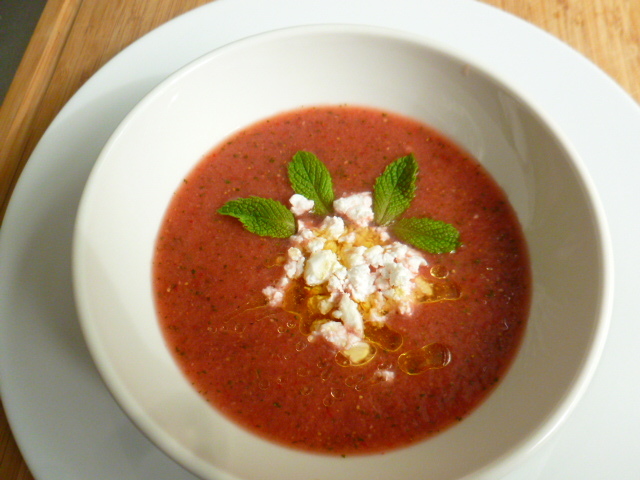 What a delicious, refreshing summer soup! I love ginger in it. Thank you so much, Ronit, for sharing! What a clever idea Ronit, this soup. So perfect for warm weather and so original. I love it. 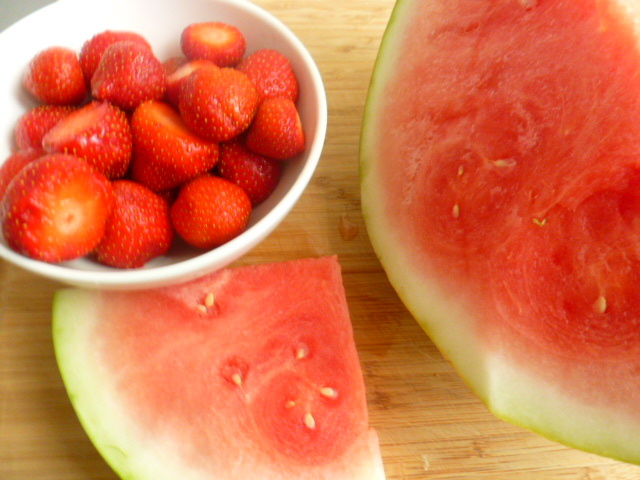 I do love watermelon in hot weather! Unfortunately it’s been unseasonably cold this week. I’ll have to try watermelon with ginger, it sounds so bright and refreshing! What fun! I’ll bet that ginger adds a real bite! 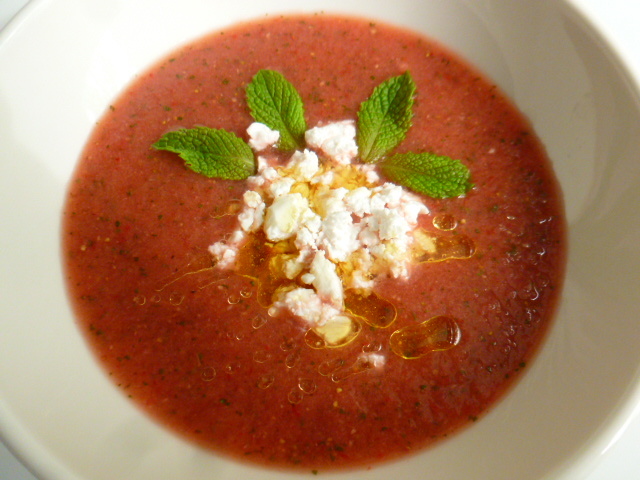 I’ve never tried watermelon soup, it certainly sounds great for summer. 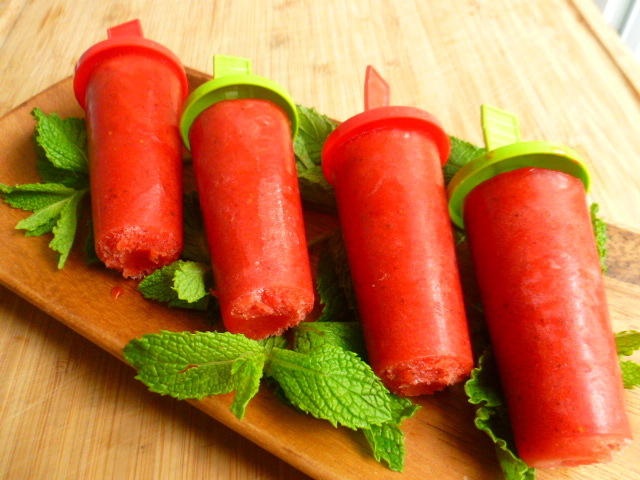 And those popsicles look amazingly refreshing. Two great recipes. What a beautiful recipe, Ronit. Sadly we are heading for mid winter here in New Zealand so I will be stashing this recipe in my “can’t wait for summer” folder. The popsicles are fabulous! When it gets too hot here, I do wish we’d head to mid-winter! At least there are all the wonderful fruits to compensate for it. The popsicles look so refreshing! Perfect for a summer day! Thank you Judi! 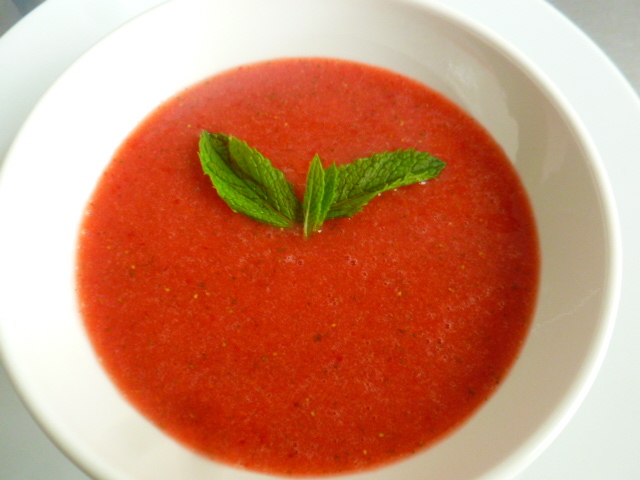 I love both watermelon and strawberry soups, but I too didn’t combine them together until now. The main reason was adding some color to the pale watermelon, but now that I saw how good they work together, I will definitely combine them again. This sounds incredible. And with the goat cheese?!!! Yum.! Thank you Marisa, I’m glad you liked the recipes. 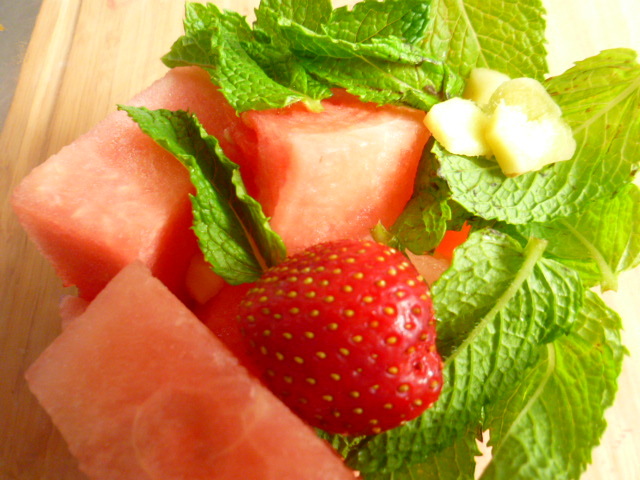 I never mixed watermelon and strawberries until now, but will do from now on, as the result was so tasty and colorful. You had me at balsamic in soup ❤ I’m looking forward to trying both versions.. Both will be so refreshing on a hot day ! My dad makes fresh pineapple popsicles.. There is nothing like fresh fruit for popsicles.. They are much tastier, cheaper and healthier to make than to buy.. Thank you, I’m glad you liked the recipes. I hope you’ll enjoy them as well. You’re so right about homemade popsicles. They are so easy to make and so much healthier and tastier than commercial ones. Terrific ! Thanks for the link with a new spin on them..
😂 Imagine my surprise when I linked to that.. Seeing tomatoes..
What a fantastic recipe for summer! Fantastic recipes! Love to try them soon! A great refreshing treat for the summer. Beautiful two recipes. Kids would love this Popsicle’s.